Yes, I’m weird this way. After my previous post, asking for suggestions for new types on FNG, I thought of a potentially interesting type: superhero / supervillain names. This one was enjoyable to do, since I’ve been a superhero comics fan for more than 30 years; it’s fun to see suggestions for characters that sound like the ones I’ve read about since my childhood… or ones that sound completely ridiculous (which is OK, there are precedents). Still, my request in the previous post remains: I’d love to hear any suggestions / ideas / questions you may have. 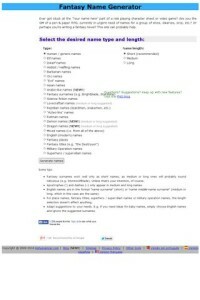 This entry was posted in New on FNG on June 22, 2013 by Dehumanizer. 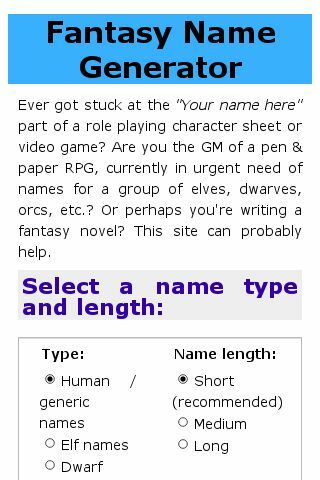 As of today, elf, dwarf and orc names have been greatly improved (both in terms of quality, and of variety). There have been some very small improvements to some of the other name types as well. I hesitated about posting about this, though, as the idea was for blog posts to introduce new features, not just “hey, names X and Y are now better”. But I have a problem here, and I need your help: I need ideas for new name types. Yes, I could visit any of the many other generators on the web, but I really don’t want to copy ideas from the “competition”. Besides, it may well be more useful to answer needs from actual FNG users, instead of just adding random types “because I can”. So… suggestions? 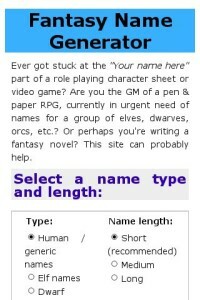 Any name types you’d find useful? Or other new features? Not a huge change today, in terms of work, but I think this makes each generated list of names (instead of individual names) more interesting. Up to now, except for some special name types (e.g. military operation names, English names, etc. ), the “size” selection worked like this: “short” names had 2 syllables, “medium” names had 3, and “long” ones had 4. As of now, the above values haven’t changed, but some variation was added: for each generated name, there’s a 10% chance of having one fewer syllable, and another 10% chance of having one more. So, a 20-name list of short names, for instance, will, on average, consist of 16 2-syllable names, 2 1-syllable ones, and 2 with 3 syllables. One consequence of this is that, for the first time, 1-syllable names (and 5-syllable ones, if you choose “long”) appear from time to time (and some of them are even decent!). But, more importantly, each list of generated names is less uniform, and therefore less predictable. I hope you’ll agree that this is an improvement. I also added the two most recent name types, “reptilian” and “Aztec-like”, to the Portuguese language version. This entry was posted in New on FNG on June 17, 2013 by Dehumanizer. As I mentioned yesterday, I wasn’t entirely satisfied with the quality / variety of the generated reptilian names. However, I had a thought; besides usually having lots of “esses”, in several fantasy universes, reptilian races are associated, for some reason, with “Aztec-like” cultures (e.g. Warlords Battlecry 3). This has allowed me not only to improve the reptilian names, but also to add a new type, “Aztec-like” names. In fact, the former are currently a “superset” of the latter. Questions? Suggestions? Feel free to add a comment. This entry was posted in New on FNG on June 16, 2013 by Dehumanizer. There’s still room for improvement; I already have a few ideas to do so. Anyway, any comments / questions / suggestions? This entry was posted in New on FNG on June 15, 2013 by Dehumanizer.